If you have never shopped at Etsy, I encourage you to do so. It’s a wonderful source for handmade crafts and one of a kind products. 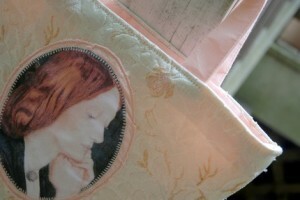 I was browsing around today and was thrilled to see this adorable purse featuring one of Rossetti’s portraits of Elizabeth Siddal (click photo to be taken to the purchase page or to view details). Isn’t it lovely? The maker is AmandaBeth Boutique and her blog is here. UPDATE: I see the purse sold on August 22. I hope the Lizzie purse found a loving home. And if the purchaser happens to visit here, I would love for them to comment! A lovely purse. Etsy has so many wonderful things! At the risk of appearing to be a post hog (!! ), just letting you know I purchased the Lizzie purse, after giving it a few weeks to see if anyone else would buy it. It is lovely, beautifully crafted, and just incredibly sweet. I will treasure it always. Thank you for letting us know it was available! I will try to refrain from commenting on anything for a while :).